QuaHill aims to provide maximum flexibility to cover various work flow requirements raised by agencies. Therefore, it is possible to define lists of values frequently used by the agency, such as languages, services, units, currencies, quality assessment levels for ISO-certified agencies, etc. Any user who is assigned the respective right can change these values. Most values in code lists are defined in four languages (English, German, Czech and an optional language which can be defined in the global settings). This makes communication with clients and vendors easier. If a client does not speak English, you can send him/her a quote or invoice in German as print templates and email templates can be defined in the four languages as well. 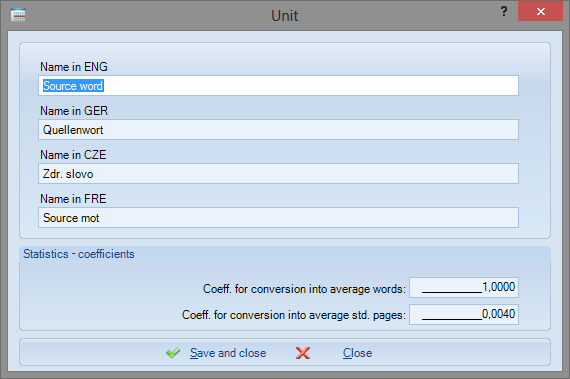 Every user can define in his/her details which language version from the code lists will be used in QuaHill. 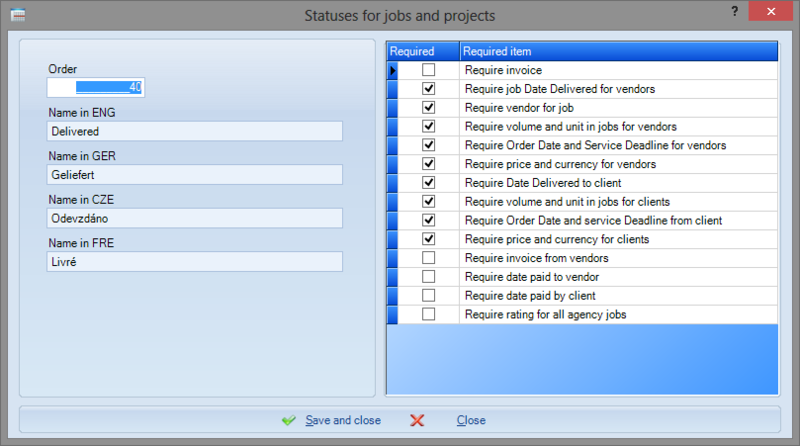 If an agency has selected a language into which QuaHill has not been localised yet as the main language, it is possible to choose the language in the global settings, modify the values for the language in the code list and switch QuaHill user settings to use the values from the code lists. In that case, although the system is displayed in e.g. the English version (or a different localised language version), all code list values are displayed in the particular localization set in the user's details. Why are values in code lists in four languages? QuaHill allows you to create printed documents and emails fully localised in the four languages. To allow the localization of code list values, they must be pre-set in the four languages as well. However, you will have to edit these values at the very beginning and not later. It is highly unlikely there would be significant changes made in code lists during work with the system. Subsequently, you will benefit from being able to create fully localised invoices, quotes, enquiries, orders, etc. Why do the code lists include the Czech language? Our agency will not use it. Due to historic reasons. QuaHill started in 2009 in the Czech market and later on started to expand to foreign markets. It is not necessary to use it. Some clients use this localization version as another optional language. What if I need a language which is not in the code lists? You can change the optional language (French in the default setting) in the global settings to any language which is available in the language code list. Then you just modify the values for the language in the code lists and select the localization as default in the user settings. Working in a distributed team, our growing translation partner network needed a fully featured - yet flexible - central repository. QuaHill has become the hub where everything comes together: project managers, clients, colleagues, data. More than just a tool, it is now a vital part of our business.